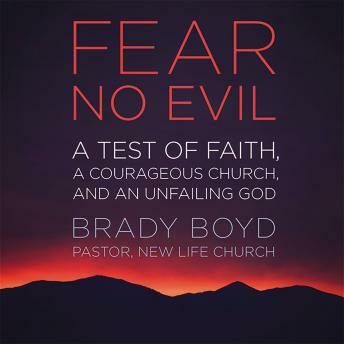 In the years following the senseless and tragic shooting on the campus of New Life Church in northern Colorado Springs, Colorado, Senior Pastor Brady Boyd has received countless questions from the faith-filled and faithless alike. As the nation watched the suffering congregation reel from the gunman’s rampage and, later, steady their stance once more, the one question on everyone’s mind was, 'How has New Life weathered such a horrible storm so well?' In Fear No Evil, Boyd answers with eloquence and grace, paving a path toward hope to anyone walking through the 'valley of the shadow of death' and is tempted to camp out there. This story of tragedy and triumph will release you from life’s common traps of doubt and despair. Whether you are a parent who has lost a child, a single mom who feels overwhelmed, a middle-aged man starting over after bankruptcy, a student trying to make sense of life and the world at large, or simply someone who wonders where God is in the midst of your suffering, the considerations and counsel offered here will serve as a lifeline for your soul.